We know every student by name and by need. 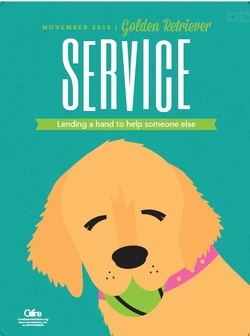 November Core Value: Service- lending a hand to help someone else. These days, the image of a soldier reuniting with family at the airport has an outsize emotional impact. After years in which our country’s military personnel were given extended deployments to fight wars that have produced new possibilities of personal catastrophe, there’s been some powerful photojournalism documenting the early moments of those who make it home — scenes of incredible relief etched in faces and onto bodies. Old grief and immediate joy seem somehow to merge. There are no words, these images seem to say. Greg Ruth’s heart-wrenching, nearly wordless picture book invites us into one such reunion story. It’s told in warm, almost photorealistic watercolors that use shades of orange, red and yellow to soften and brighten the edges of the predominant army-green. A blond-haired boy of about 7 or 8, wearing camouflage shorts and a red T-shirt, waits with a crowd behind a rope at an airport. Once everyone is allowed to run onto the tarmac, he zigzags around, witnessing others’ happy moments. One soldier beams as he touches his partner’s pregnant belly. Another bends on one knee to give his daughter his cap. We see it allmostly from the boy’s eye level, reminding us that the situation he has been thrust into — having a parent away fighting a war — is dauntingly large and forbidding for a child. We hope that by pairing our literacy curriculum with the Core Essential Values program that we can gently reinforce healthy concepts while promoting a love of reading. We invite you to read along with us! The November Core Value is Service and is represented by the Golden Retriever. For more information about the Core Essential Values program, please visit Lakeview Counselor, Mrs. Lowe.